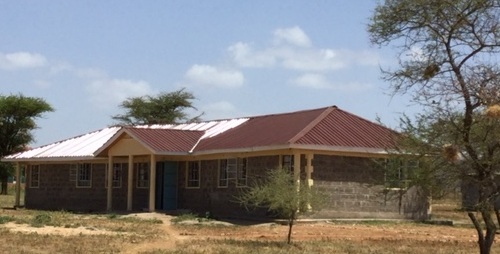 Linda’s Library at Grace Girls’ High School – we are seeking to put a Linda’s Library next to each school. The gentleman who is helping us with water wants to get five 10,000-liter tanks with gutters for Grace Girls’ High School. We would put one at each dorm and one at the dining hall. We get water now from a good source, but it is available only three hours a day. If the pressure is low, we get little water. Then there are times when the system is down, like last year when we had no water for several months. Getting tanks and gutters would help with these problems. 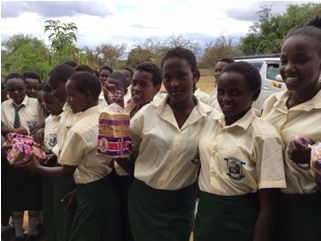 We brought 45 loaves of bread for the girls and presented them to the new students on the steps of Linda’s Library. The girls were excited to welcome visitors. This school is deep in Maasai Land. Grace Girls’ High School is providing girls with an opportunity to do great things. Girls in this area are often the last to be educated and have the least opportunities. Thanks for your help and prayers. Please consider joining The Outreach Foundation’s trip to Kenya November 11-22, 2019. Read more about Girls’ Education and Rescue Centers in Kenya HERE.